On Saturday 21st AprilI had the great pleasure of officiating at the wedding of Karen and Kyra, held at Dorney Court, Dorney, Windsor. Two wonderful ladies enjoyed a glorious day joined by a host of family and friends at a fantastic venue. Thank you to Karen and Kyra for choosing me as Toastmaster for your special day. I really enjoyed working for you both and it was a pleasure to be able to care for you all. On Saturday 18th June I had the great pleasure of officiating at the wedding of Oktawia Jaworska and Stuart Fordham, held at Fanham's Hall, Ware, Hertfordshire. What a fantastic couple and a glorious day enjoyed by a host of family and friends. Thank you to Oktawia and Stuart for choosing me as Toastmaster for your special day. On Saturday 14th May I had the great pleasure of officiating at the wedding of Ashleigh McMillan and Soloman Akinyemi at Shendish Manor House, Apsley, Hemel Hempstead. The new Mr and Mrs Akinyemi had a wonderful day with family and guests and there was a Nigerian National dress theme to add colourful costumes and style to the evening events. Thank you to Ashleigh and Solomon for choosing me as Toastmaster for your special day, it was such a fantastic event. On Saturday 2nd April I officiated at a fantastic wedding of Paul Hart-Sloane and Stan Hart-Sloane. The venue at the Alverton Manor, Truro, Cornwall, was superbly set. Arriving on the Friday evening I had time to explore the settings and I was amazed at the venue. On the big day the guests began to arrive and the weather changed for the better. You guys', your family and guests were such good fun to be with and everyone partied into the night. Thank you for choosing me as Toastmaster for your special day. Good luck for the future Paul and Stan. 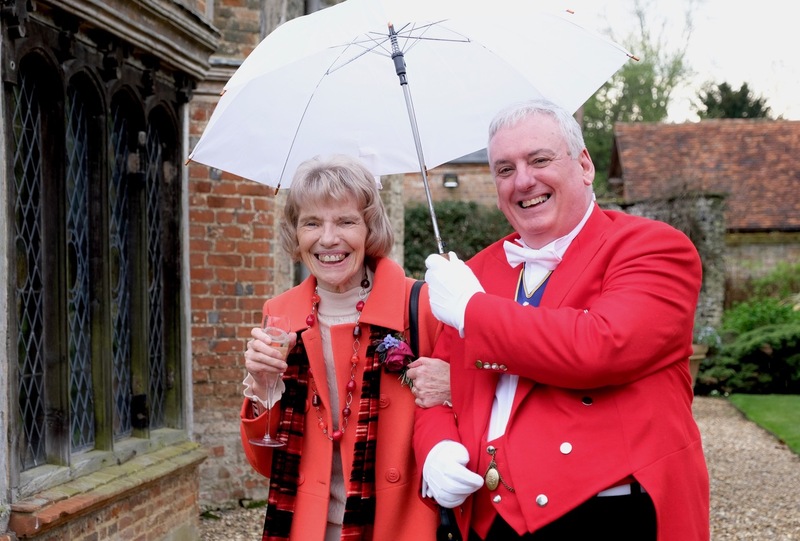 On Saturday 28th November I had the great pleasure to officiate as Toastmaster at Nicola and Mike Sharkey 's wedding at the The Watermill Hotel, London Road, Bourne End, Hemel Hempstead. I arrived early at the venue to meet the Groom, Best Man and Usher and paid a visit to the Bride to be and her Parents Tony and Elizabeth. I was then in a position to meet and greet the guests as they arrived for the occasion. What a fantastic day it turned out to be with a fantastic couple, family and friends who all played a part in making the day, and what a wonderful venue. Thank you Nicola and Mike for choosing me as Toastmaster for your big day. On Sunday 23rd August I had the pleasure of officiating at Eve Lamb and Andrew Lamb's wedding at DeVere Venues Theobolds Park. Upon arrival at the venue I met a host of family and friends, gathered for the happy occasion. This was my first Jewish wedding and I was as excited as the Bride and Groom! I met with Eve and Andrew in their respective room's and as the sun shone through the grey skies and the clouds disappeared the wedding party and guests made their way to the courtyard where the Chuppah Ceremony began. The wedding party was greeted by the Wedding Singer, Benjy Caplan, accompanied by Aviva Braunold on the keyboard. The Caterer's Goldstein and Sons provided a fantastic reception and wedding breakfast. What a fantastic day it turned out to be, supported by wonderful family and friends, who partied well into the night! Congratulations Eve Lamb and Andrew Lamb, enjoy your Honeymoon. On Saturday 8th August I had the great pleasure of officiating at Katie and Stephen York's Wedding at St Mary and St Joseph's Catholic Church, Boxmoor and then later at the Boxmoor Lodge, London Road, Hemel Hempstead. Arriving at the Church at 13:30 there was a large number of family and guests eagerly waiting to greet the Bride and Groom. Stephen arrived with his Best Man Andy, who was dressed in a Kilt and Scottish dress regalia. Katie arrived on time, transported by a very stylish VW camper van, to be greeted by Father John Byrne. The weather was terrific and after the ceremony, family and guests hurried back to the Boxmoor Lodge for the Reception and Wedding Breakfast. The day was truly supported by a host of family and friends and it was a great pleasure for me to officiate at this event, especially as I know Katie's father, Sterling Moss and some of the guests. Katie and Stephen, thank you for choosing me as Toastmaster on your special day. On Saturday 25th July I had the great pleasure of officiating at Dean and Rebecca Wright's Wedding at The Broadway Hotel, Restaurant & Carvery Letchworth. What a fantastic day was had by all. What a lovely couple with smashing family and friends. Thank you for choosing me as Toastmaster on your special day. The happy couple and their guests were surprised by a David Brent lookalike Tim Oliver (https://www.facebook.com/RickyGervaisProfessionalLookalike) who turned up and performed a comedy act during the wedding breakfast. What a great day! What a fantastic day it turned out to be with a fantastic couple, family and friends who all played a part in making the day, and what a wonderful venue. Thank you Jane and Andy for choosing me as Toastmaster for your big day, and well done to Roy Bennett who was the fantastic best man of the day! On Sunday 5th April I officiated at the wedding of Jamie and Claire the new Mr and Mrs Chance at Sopwell House, St Albans, Hertfordshire. What a wonderful wedding, a wonderful day and a wonderful couple! It turned out a fantastic day, set in a beautiful location and more importantly with a great wedding party and guests! Thank you for choosing me as Toastmaster on your special day. On Saturday 20th December I officiated at the wedding of Ben and Toni-Ann the new Mr and Mrs Richards at The Mansion House, Old Warden Park Biggleswade. The wedding was supported by a host of family and friends. 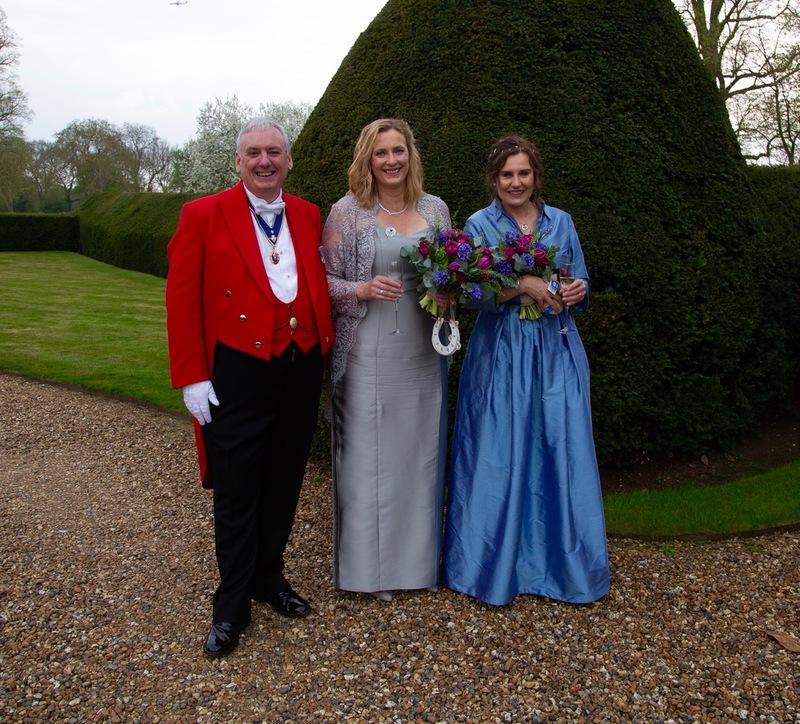 Thank you to Ben and Toni-Ann for choosing me as Toastmaster on such an important day in your lives. Here are some photos from the day, including a first 'selfie' with Andy, one of the guests! On Friday 10th October I officiated at the wedding of Dean and Leanne the new Mr and Mrs Cleaver at St Andrews Church, Biggleswade and reception at The Sun, Hitchin. Leanne and Dean are such a fantastic couple with a great sense of humour! they had the 'Trotter' 3 wheeler to bring them from the church to reception. The day flowed along with elements of fun. I even got in on the act when I spotted a hat which matched my uniform at the 'photo booth'. The new catchphrase I think is "I can do your wedding - Just like that"
The wedding was supported by a host of family and friends. Thank you to Leanne and Dean for chossing me as Toastmaster on such an important day in your lives. I spotted a hat which matched my uniform at the 'photo booth'. The new catchphrase I think is "I can do your wedding - Just like that"
On Friday 26th September I officiated at the wedding of Rick and Leighanne the new Mr and Mrs Archer at the Mecure Parkside Hotel, Woughton on the Green. The weather was perfect for a fantastic couple, family and friends. Congratulations to Rick and Leighanne and thank you for choosing me as Toastmaster. It was a privilege and a pleasure working for you both on such a special day. On Saturday 30th August I officiated at the wedding of Dean and Stacey the new Mr and Mrs Leavens at Bushey Country Club. The weather was perfect for a fantastic couple, family and friends. Congratulations to Dean and Stacey and thank you for choosing me as Toastmaster. It was a privilege and a pleasure working for you both on such a special day. On Saturday 9th August I officiated at the wedding of John and Kay the new Mr and Mrs Jeffries at St Mary's Church, Shephall Green, Stevenage and then reception at Homestead Court Hotel, Welwyn Garden City. The day turned out perfect weather for a fantastic couple, family and friends. Congratulations to John and Kay and thank you for choosing me as Toastmaster. It was a privilege and a pleasure working for you both on such a special day. On Saturday 2nd August I officiated at the wedding of Jon and Hollie the new Mr and Mrs Lale at St Thomas a Becket Church, Northaw and then reception at Capel Manor Gardens, Enfield. The day turned out perfect weather for a fantastic couple, family and friends. Congratulations to Jon and Hollie and thank you for choosing me as Toastmaster. On Saturday 26th July I officiated at the wedding of Mark and Lara the new Mr and Mrs Ryan, where the reception was held at Bride Hall, Ayot St Lawrence. The weather turned out perfectly which helped make the day. A fantastic couple with lovely family and friends who thoroughly enjoyed themselves. Congratulations to Mark and Lara and thank you for choosing me as Toastmaster. On Saturday 5th July I officiated at the wedding of Katy and Stuart, the new Mr and Mrs Saunders, where the reception was held at the King's Head, Ivinghoe. Head https://www.facebook.com/KingsHeadIvinghoe. Congratulations to Katy and Stuart and thank you for choosing me as Toastmaster. What a great night at Steve and Vivienne Goan's Ladies Festival - Goffs Oak Lodge No 7169 at the Abbots Barton Hotel Canterbury. Thank you to Steve and Vivienne for choosing me as Toastmaster at Abbots Barton Hotel Canterbury. 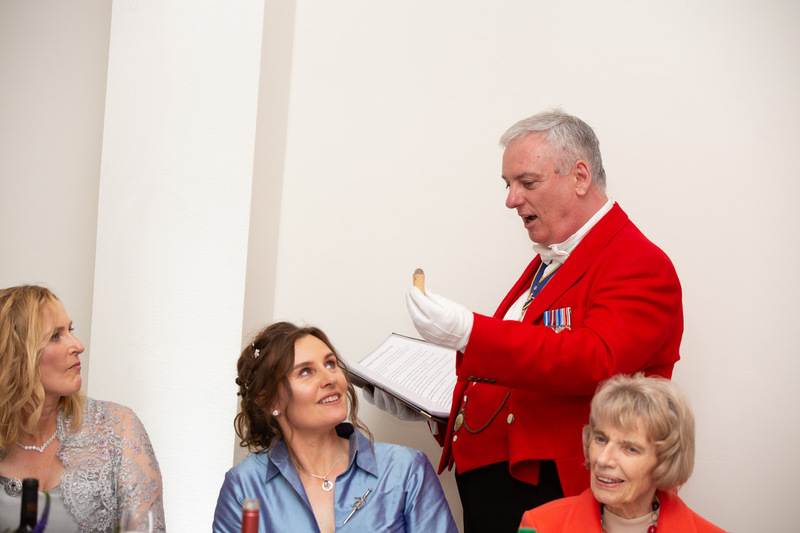 Thank you to Keith and Belinda Coote and James and Mikayla Coote, the Presidents' and their Ladies for choosing me as Toastmaster for their special occasion. What a great night it was. — at Royal Chace Hotel.